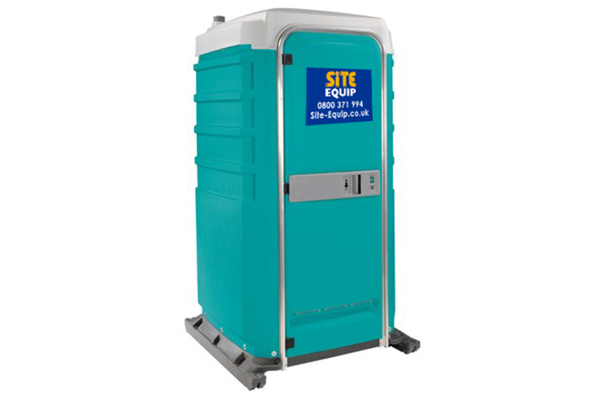 The single mains connected portable toilet is perfect for those long term building projects where there is mains drainage, water and an electricity supply on site. These mains connected portable toilet do not require a weekly service as when connected to the sewage provide a fully flushing system, just like the toilet in your home. When the mains connected portable toilet is connected to a power supply it will provide hot running water, into a large wash basin which enables you to wash up to your elbow. These mains connected portable toilets are recommended by the Health and Safety Executive to ensure your sites welfare and sanitation hygiene exceeds standards. If you do not have mains drainage please see our range of portable chemical toilet which are fully self contained. Available as 110 V or 240 V.
Requires 15mm water inlet, 110v or 240v electrical supply and 110mm waste tanks. Why order your mains connected portable toilet from Site Equip? Professional Service, our mains connected portable toilet service is the best in the UK, if you do not believe us take a look at our awards page!